Report to your pools 15 minutes before it is supposed to start. Disqualifications are 15 minutes after your match is called. Tournaments with 15 players or less will pay out to the top 2 finishers. Tournaments with 16 to 155 players will pay out to the top 3 finishers. Tournaments with 156 players or more will pay out to the top 4 finishers. Pot bonuses will be paid out with the same amounts unless otherwise stated. Format: 2/3 Rounds, 2/3 Games (Top 8 – 3/5 games), Double Elimination, 99 Seconds, Random Stage Select. Rules: All characters allowed in a three (3) game set. Players who lose a game may change their character, and the winning player is character locked until they lose. Blind pick is available for all matches, contact a judge or bracket runner at the character select screen to adjudicate for you. Random Stage select is to be used. Kanzuki Beach and Skies of Honor are banned. Controllers: Legacy controllers not allowed. Brooks converters allowed, but Cronus converters are banned.If you use a PS4 Dualshock or wireless controller of any kind, be sure to disconnect or desync it after every match, failure to do so will be grounds for DQ if another match is interrupted. Prizes: Full prize pool to be announced in the lead up to the event. The prize pool will include of a share of the cash entry fees for each tournament entrant, and a bonus from Capcom which will be given out according to CPT rules, not according to the general payout rules. BAM9 is a Capcom Pro Tour Premier Event; finalists will receive CPT ranking points towards qualification to the Capcom Cup Finals. Legal Stages: Final Destination, Smashville, Town and City, Lylat Cruise, Battlefield, Dreamland 64 (Counterpick Only). At the start of a match 1-2-1 Stage striking will occur. The person who strikes first is decided by paper scissors rock. You may not choose the last stage you won on in a counterpick situation, unless both of the players agree to it. Rules: If a player wishes to pick a character without the opponent being able to counterpick, they can choose to enact a double blind, where both players will inform a TO of their pick and then the TO will announce both of the characters. Mii Fighters are legal, and can use any combination of custom moves. Mii Fighters must be default Mii’s. Full ruleset here. Controllers: Wireless controllers are allowed, however if your controller interferes with the tournament in any way, you will be instantly disqualified. Wiimote owners are advised to take out your batteries after a match, and Pro controller users must take the battery out, and use a usb connector. Prizes: Full prize pool to be announced in the lead up to the event. The prize pool will include of a share of the cash entry fees for each tournament entrant. 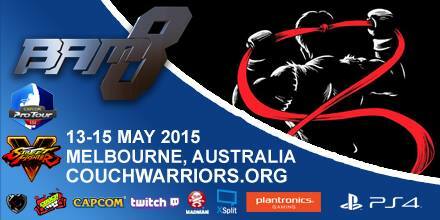 Judges: The organiser for Smash WiiU is Jack Gorman aka Pudge. Legal Stages: Singles: Yoshi’s Story, Fountain of Dreams, Battlefield, Final Destination, Dream Land, Pokemon Stadium (Counterpick Only). Doubles: Yoshi’s Story, Pokemon Stadium, Battlefield, Final Destination, Dream Land. At the start of a match stage striking will be employed at the judge’s discretion. You may not choose the last stage you won on in a counterpick situation, unless both of the players agree to it. Rules: If a player wishes to pick a character without the opponent being able to counterpick, they can choose to enact a double blind, where both players will inform a TO of their pick and then the TO will announce both of the characters. Wobbling is legal, but wobbling past 250% is to be considered stalling and is not allowed. Additional rules apply which can be found here, and by talking with available tournament judges. Controllers: Wireless controllers of all kinds are banned. This applies to the Nintendo 3DS, Wii Remotes, Wii U Pro Controllers, Wii U Gamepads, Wavebird GameCube Controllers, and all other controllers that connect wirelessly in some capacity to the GameCube or Wii U consoles. Judges: The organiser for Smash Melee is Darren Taing aka Dreadtech. Legal Stages: Starters: Fire capital, Air Armada, Rock wall, Mercant port, Blazing hideout, Frozen fortress, Tower of heaven. Counter picks: Treetop lodge, Tempest peak, Aethereal Gates, The endless abyss. Rules: 3-2-1 Ban order is done for the start of a set. In a best of 3 set, the winner of the previous game can ban 4 stages and then the loser of the previous game picks a stage from the remaining stage pool. In a best of five, the winner of the previous game can ban 2 stages and then the loser of the previous game picks a stage from the remaining stage pool. Controllers:Xbox one and gamecube controllers are both legal. So is any controller that is plug and play in windows 7+. “Traveling under the stage once from the ledge” is defined as dropping off the ledge on one side of the stage and reaching the height of the original ledge on the other side of the stage. When one of the players is attacked by the other and takes damage, this rule does not apply. The moving platform on Smashville is considered to be equivalent to a ledge, i.e. if a player starts from the moving platform on one side of the stage and travels beneath the stage to the ledge/platform on the opposite side of the stage, the player may not travel beneath the stage back to the ledge/moving platform on the opposite side before until he lands back on the platform. If stocks and damage percent are identical, the match will be replayed on the same stage, with each player at one stock. If a player wishes to pick a character without the opponent being able to counterpick, they can choose to enact a double blind, where both players will inform a TO of their pick and then the TO will announce both of the characters. Judges: The organiser for Smash Brawl is TBA. Rules: If a player wishes to pick a character without the opponent being able to counterpick, they can choose to enact a double blind, where both players will inform a TO of their pick and then the TO will announce both of the characters. Controllers: If a player is using a Wiimote then they must remove the batteries from their controller after leaving the setup to prevent disruptions in the future. Rules:All characters allowed. Random Stage Select. Players who lose the first game may change their character, and the winning player is character locked until they lose. Blind pick is available for all matches. Controllers: PS4 sticks and pads. Sticks will be provided. Judges: The organisers for Tekken 7 are Baraa. Rules: All characters allowed in a three (3) game set. Players who lose a game may change their character, and the winning player is character locked and variation locked until they lose. Blind pick is available for all matches, contact a judge or bracket runner at the character select screen to adjudicate for you. Controllers: Brooks converters allowed, but Cronus converters are banned. If you use a PS4 Dualshock or wireless controller of any kind, be sure to disconnect or desync it after every match, failure to do so will be grounds for DQ if another match is interrupted. Format: 2/3 Rounds, 2/3 Games (WF, GF, LF – 3/5 games), Double Elimination, default time. Rules: All characters allowed in a three (3) game set. Players who lose a game may change their characters, and the winning player is character locked until they lose. Both players may change team order at the start of any game. Blind pick is available for all matches, contact a judge or bracket runner at the character select screen to adjudicate for you. Format: 2/3 Rounds, 2/3 Games (LF, WF, GF – 3/5 games), Double Elimination, 99 Seconds, No Handicap, No Edition Select. Rules: All characters allowed. Players who lose a game may change their character, and the winning player is character locked until they lose. Blind pick is available for all matches. Eclipse colour is banned. Stylish mode is allowed. Singles will be run on Revalator. Teams will be run on Rev2 demo. Controllers: PS4 and PS3 sticks and official Sony pads allowed. Judges: The organiser for GGXrd is Javi. Rules: Unlimited Characters banned. All other normal characters allowed. Players who lose a game may change their character, and the winning player is character locked until they lose. Blind pick is available for all matches. Stages ‘Forbidden Gate’ & ‘BLUE’ are banned. Judges: The organiser for BB is Javi. Rules: Akuma is banned. O. Gief is banned. Players are responsible for inputting their own character select codes. Judges: The organiser for ST is Spidercarnage. Controllers: Legacy controllers not allowed. Brooks converters allowed, but Cronus converters are banned. If you use a PS4 Dualshock or wireless controller of any kind, be sure to disconnect or desync it after every match, failure to do so will be grounds for DQ if another match is interrupted. Judges: The organiser for DOA is Aaron Borg aka BORGIE! Rules: EX characters and E. Ryu are banned. Judges: The organiser for SFA2 is Spidercarnage.